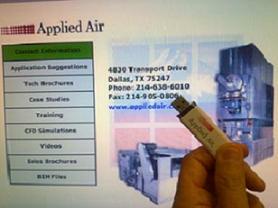 Applied Air is introducing a USB Flash drive application that gives the user access to a wealth of information about the Applied Air, Alton, and Aztec products. The application includes case studies, IOM manuals, Technical Guides, CFD videos, marketing videos, training PowerPoint programs, and downloadable BIM files. These devices are available now from any Applied Air representative or directly from Applied Air.